"Oh Jeanne, to reach you at last, what a strange path I had to take." It is one of the most famous lines in cinema history, marking one of the most analyzed and critically praised climaxes in any film. But what a strange Bresson takes us on before we reach it at last. 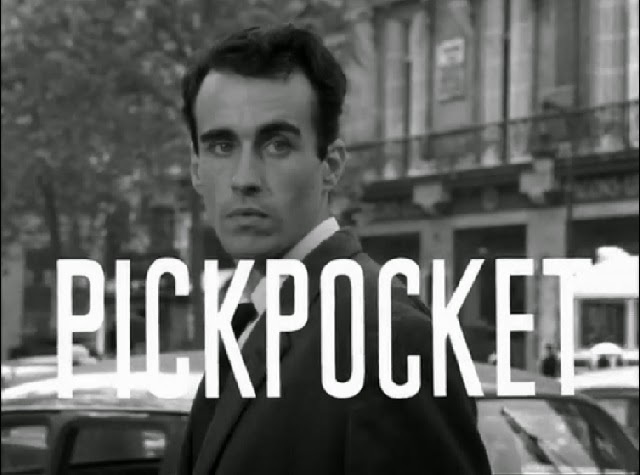 "Pickpocket" (1959) is not so much an adaptation of Dostoevsky's "Crime and Punishment" as it is an echo of it. Like Raskolnikov, Michel (Martin LaSalle) theorizes that certain superior people (like himself) should not be held to the same laws or moral standards as others. Bresson makes a major change, though. Raskolnikov tests his theory by murdering an innocent woman; Michel becomes a pickpocket. As a dramatic choice, it is a curious one. Thievery is hardly on the same plane as murder, and the stakes in "Pickpocket" aren't nearly as high as those in Dostoevsky's novel. But classical dramatic tension would only serve as a distraction in a film which pursues a more elusive goal. Michel lives alone in his tiny, featureless room where he reads, broods, and gradually cuts himself off from his loved ones. His friend Jacques (Pierre Leymarie) tries to be supportive, but Michel doesn't care. Michel's mother is dying, but he can't be bothered to spend time with her. Not even an appeal from Jeanne (Marika Green), his mother's young neighbor and caretaker, can jolt him from his selfish pursuits. Michel wants only to perfect the pickpocket's craft. Why? The film offers no direct explanation which shouldn't surprise anyone familiar with Bresson's methods. Bresson strips his films to the barest essentials, omitting many traditional elements including motivation and, at times, even the main action. Major events such as Michel's arrest or his mother's death occur off-screen or are only barely hinted at. Bresson tells his stories in the most concise manner possible. When Michel pulls off a theft at a racetrack, the scene simply cuts from hands to face, hands to face, all while the sound of galloping horses is heard off-screen. A two year trip to London is described by a single line of voice-over. As usual, Bresson directs his actors (whom he referred to as "models") to perform as flatly as possible. Do not look warily, simply look. Do not walk nervously, simply walk. Meaning derives from the manner in which images are cut together, not from the performance itself. Think of it as filming without adverbs. Michel's terse narration reflects this style: "I hesitated" or "I was exhausted. I slept until morning." Literary critics would describe this as "muscular prose" a la Hemingway. Bresson is certainly a "muscular" director. Though he is often called a minimalist, his films are densely packed. Because he omits so much of the traditional cinematic baggage, each sound (Bresson valued sound as much as any other element of what he called his “cinematograph”) and image is meticulously chosen for maximum impact. For a director so often described as abstract or transcendental, Bresson deals exclusively in very concrete sounds and pictures. Michel becomes increasingly absorbed in his dangerous game while being pursued by a suspicious police inspector (Jean Pelegri). This is another echo from "Crime and Punishment" but seems misplaced here; why would the inspector mobilize the entire force simply to capture a petty thief? Regardless, Michel seems to enjoy outwitting his nemesis and thus asserting his superiority. Though we can only guess at Michel's motivations, he clearly cares for nobody but himself, a tragic flaw that threatens to cripple him. He repeatedly turns down all gestures of kindness from Jeanne, perhaps because her innocence and selflessness shames him. His crimes become more and more daring to the point of recklessness. In the end, he even suspects he is being set up by the police, but tries to pull off a theft anyway. Is it because of arrogance or because he wants to get caught? In jail, Michel hits rock bottom. His mother is dead, his friend is gone, and his illusions of superiority have been shattered. He even contemplates suicide which is conveyed, in Bressonian fashion, by a single clipped line of narration. He claims he does not see the walls or bars of his prison, but his words are empty boasts. Where can Michel possibly go from here? Jeanne visits him a few times, but Michel does not respond until she writes a heartfelt letter that pierces him to the core. In the final scene, Michel looks at Jeanne as if seeing her for the first time. He claims that a light shines upon her face though we see no such light. He reaches through the bars to kiss her gently on the forehead: "Oh Jeanne, to reach you at last, what a strange path I had to take." The effect is a startling one. Throughout the entire film, Bresson has denied any overt expression of passion or emotion. He tamps down the drama and tension as if holding down the lid on a boiling pot. But now he finally lets it all spill over in one climactic moment of release. Sexual metaphor is unavoidable here – this is a climax in every sense of the word. Michel has sought meaning in the most meaningless of activities, and simulated intimacy by close contact with his victims. Now, for the first time, he establishes a real human connection. Through Jeanne, Michel experiences both redemption and grace. At least that's the general interpretation of the scene, the one favored by supporters such as Paul Schrader who calls "Pickpocket" the most influential film in his career. But Bresson's films are so inherently ambiguous, so dependent on the viewer's active involvement, that we have to consider a less generous interpretation. We have seen that Michel is a selfish and lazy man who always seeks the path of least resistance. Does he pinpoint sweet, innocent Jeanne as just another easy mark? Once a con, always a con. I don't favor this interpretation, but it can't be ruled out either. So what is "Pickpocket" then? Is it a transcendental film as Paul Schrader would have us believe? Is it a unique movie that redefines cinema as Louis Malle claimed? Or is it "merely" an exceptionally well-told morality play? I don't know the answer. I do know, however, that this mysterious little film composed of silence and emptiness accumulates extraordinary power, and unleashes it in a profoundly moving moment that brings me to tears every time I see it. Of course, it might not even be the most potent ending in a Bresson film: both "Au hasard Balthazar" (1966) and "L'Argent" (1983) are legitimate contenders for that honor. No other director ended his films on such perfect notes (OK, maybe Herzog and Kubrick). Of course, few other directors had such a clear vision or exerted such precise control over every single facet of filmmaking, from acting to image to sound. A Bresson film is like nothing else. The film is presented in its original 1.37:1 aspect ratio (the original 2005 SD is listed was 1.33:1). The old SD transfer was excellent (though evidently slightly cropped) and this 2014 high-def transfer is very strong as well, though perhaps not providing a major upgrade over the prior version. Black-and-white contrast is rich and the image detail is quite sharp, a welcome enhancement for a film that focuses so much on texture and surfaces (so many shots of hands touching clothing). This is a dual-format release with a single DVD as well as a single Blu-ray. The DVD has not been reviewed here. The Blu-ray is presented with a linear PCM mono soundtrack. Bresson went to such great lengths to isolate specific sounds I've always wondered what this film would sound like separated on a stereo track, but that would be a phony update of the original mono. The audio is crisp and sounds appropriately hollow at times. Optional English subtitles support the French audio. Criterion has imported all of the extras from its 2005 DVD release. Nothing new has been added. The film retains the previous Spine Number 314. The highlight of the collection is "The Models of Pickpocket" (2003, 52 min. ), a documentary by Babette Mangolte. Thank goodness for this wonderful movie. It is impossible to review a Bresson film without mentioning his unique approach to acting, but it is often a challenge to explain it concisely. Mangolte's film does plenty of heavy lifting on this front. She interviews several of the major cast members from "Pickpocket" and asks them to describe their working relationship with Bresson. It is amazing to see how excited they are to discuss the film and Bresson more than forty years after the fact. You will learn more about Bresson's theories on acting from this film than any review you will ever read. This gem would be worth purchasing as a stand alone feature. The feature-length commentary track by critic James Quandt is jam-packed with intriguing and informative analysis. Quandt edited the definitive volume on Bresson, and has a lot to say. Since he only has 75 minutes to say it, his commentary is densely packed, to say the least, and you might have to listen a few times to absorb everything Quandt is trying to convey. A great primer on serious Bressonian criticism. The rest of the offerings are rather eclectic in nature. In his introduction to the film (15 min. 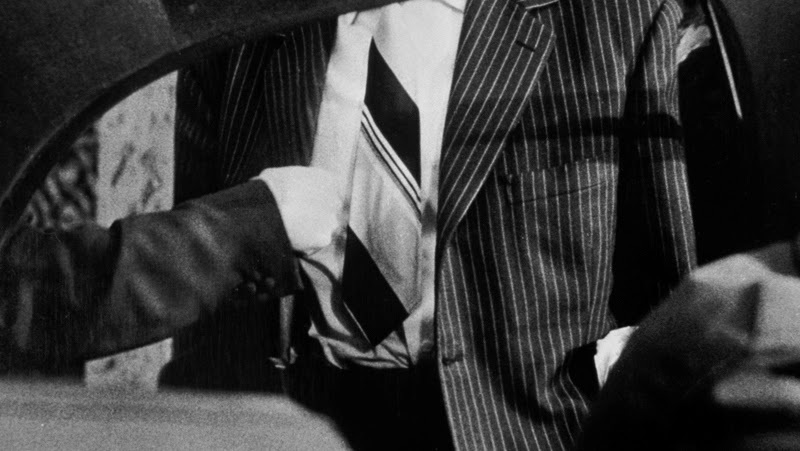 ), Paul Schrader discusses the impact "Pickpocket" had on his career, and briefly discusses some of the points he covered in his PhD thesis/book "Transcendental Style in Film." "Cinépanorma" (6 min.) is an excerpt from a 1960 French TV program in which Bresson answers questions about "Pickpocket" – he is less evasive here than he would become in future interviews. "Q and A on Pickpocket" (13 min.) is a taped session with actress Marika Green from a 2000 screening of the film in Paris. She answers all the usual questions. Kassagi was a sleight-of-hand artist who served as technical adviser to Bresson on "Pickpocket." The feature "Kassagi" is an excerpt (11 min.) from a 1962 TV show called "La piste aux etoiles" in which Kassagi performs a few magic tricks. It's little more than curiosity, but still a nice addition to the collection. The disc also includes a Theatrical Trailer. In a review several years ago, critic J. Hoberman acknowledged that viewers and critics can hold many divergent and valid opinions regarding film then added: "But I reach the edge of my tolerance in the case of Robert Bresson. Bluntly put, to not get Bresson is to not get the idea of motion pictures – it's to have missed that train the Lumiere brothers filmed arriving at Lyon station 110 years ago." I am tempted to agree with Hoberman, but I can understand why some viewers might be confused by the praise lavished on "Pickpocket." The characters hardly ever emote and aren't really designed for you to "identify" with, at least not in the usual manner. Bresson's austerity can be daunting, and a viewer can be forgiven for thinking that "not much happens." If this is your take on the film, I won't tell you that you are wrong. However, I will ask that you file "Pickpocket" away somewhere in your mind and revisit it, perhaps in a few months, perhaps in a few years. Bresson's films grow and transform with each viewing. You might be amazed at the new ways in which the film reveals itself to you. Everyone has a different favorite Bresson film. 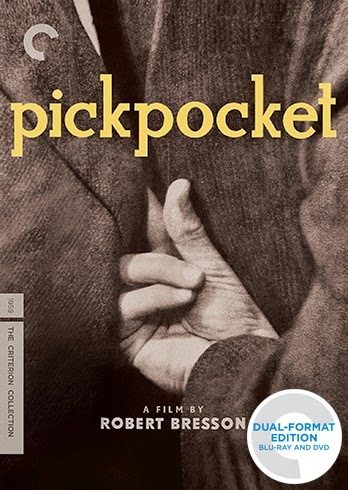 For me, "Pickpocket" rates just slightly behind his quartet of masterpieces: "A Man Escaped" (1956), "Au hasard Balthazar," "Lancelot du Lac" (1974), and "L'argent." Maybe it's the unconvincing chess match Michel plays with the police that knocks it down a peg in my estimation. No matter. It's still one of my favorite films of all-time.